Hi, I am Takehiro Hirayama, assistant professor at WAVOC who studies a small country located at the foot of the Himalayas called “Bhutan.” I would like to introduce things about Bhutan that the media usually does not cover. Part 1 is about smartphones. It was in August of 2007 that I saw a smartphone for the first time when my Bhutanese acquaintance was carrying an iPhone around in the capital, Thimphu. Smartphones were neither sold in Bhutan nor Japan at the time, but he got one during his stay in the United States, thinking it was cool. He was using the iPhone with a B-mobile (Bhutan’s cellphone provider) SIM card. Not only my acquaintance, but I noticed that most Bhutanese people are open to new trends and do not cling onto what is old. In fact, time-worn or antediluvian pieces generally do not hold value or worth in Bhutan. You could say that it is one of their characteristics as a nation to not look back on the past and live today. 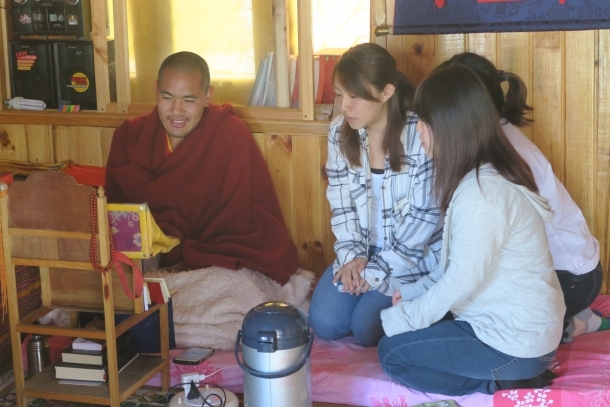 The Bhutanese government is attempting to protect its traditional values and culture as a part of its national development plan, but so many new and convenient things that are “now and young” are quickly becoming a part of their lives. Smartphones represent the many things which merged novelty, convenience and stylishness all together and became widespread. Although cellphone services only began in 2003, the percentage of cellphone owners increased from 5.96% in 2005 to 87.06% in 2015. Such dramatic change was observed in a short span of 10 years*. Aside from small children and the elderly living in rural areas, almost everyone has one. The national religion of Bhutan is Tibetan Buddhism, and smartphones have also reached the monk community as well. During prayers, you might see young monks using Facebook or WeChat with the smartphones they are hiding in their sleeves. Recently, there are smartphone applications for chanting sutras. It’s likely that there will be a number of monks studying Buddhist scriptures with a smartphone in their hand. *Policy and Planning Division, Ministry of Information and Communications (MoIC) (2016) Annual Info-Comm and Transport Statistical Bulletin (7th Edition, 2016), Thimphu: MoIC, p.10.